Institute of Management Technology (IMT), Nagpur hosted its fourth edition of Concord- The Management Olympics from January 11 to 13, 2019. The theme of the event was ‘IRIDESCENT– Time to Shine’, which enfolded the six pillars of management i.e. Business and Economics, Marketing, Finance, Business Analytics and IT, Operations and Human Resources. 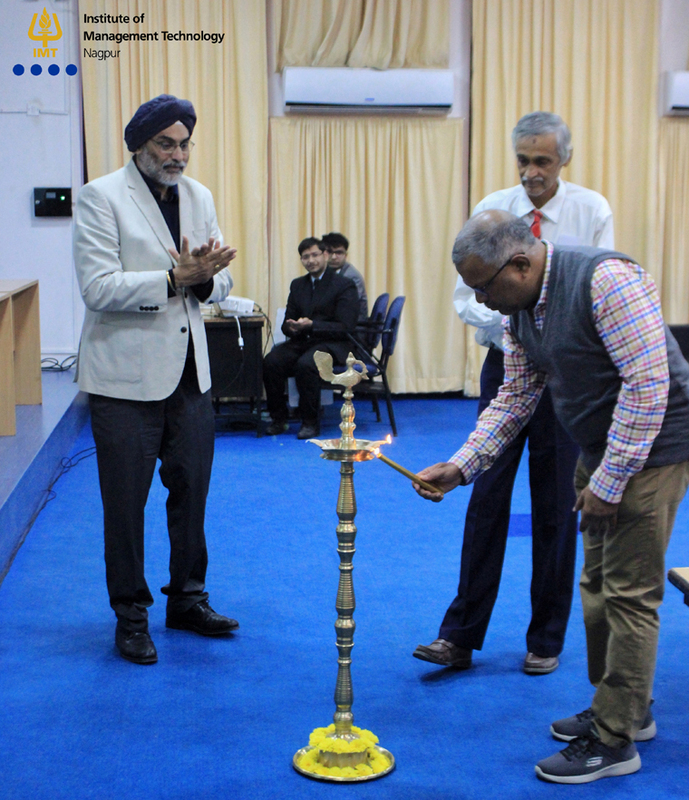 The event commenced with lighting of the lamp by our esteemed guest, Mr Birender Ahluwalia (CEO, The Positivity Company) and erudite faculty members like Dr K Nilakantan (Professor, IMT Nagpur), Dr Vinit Singh Chauhan (Associate Professor, IMT Nagpur) and Prof D N Panigrahi (Associate Professor, IMT Nagpur). Mr Ahluwalia delivered a power packed lecture wherein he imparted valuable knowledge and expertise with the students. The Management Olympics tested the participants at two levels- Gold and Silver through various innovative and enticing games organised by the academic forums of the Institute. Okonomos, the Business and Economics forum organised ‘Trade-O-Master’ and ‘Eco-Stance’ which checked all the aspects of business and economic ken of the participants. Finaholics, the Finance forum, conducted ‘Fin-acquire’ and ‘Fin-folio’ wherein the participants had to make their investments wisely to gain long term profits. xploHRe, the Human Resource forum, organised ‘Mind-craft’ and ‘Crackerjack’ which tested the students on their organisational behaviour and strategic leadership skills. Marque, the Marketing forum, organised ‘Marque-D-Vision’ and ‘Marque-O-Geneity’ wherein participants put their best foot forward to win the creative and unique rounds. Cyclops, the Operations forum, conducted thrilling games, ‘Conundrum’ and ‘Martians Chronicles’ wherein participants had to meticulously apply their logical and operational skills to get the desired results. AnalytiX, the BA and Strategic IT forum, conducted ‘Exegesis’ and ‘Infiltrator’ which tested the analytical skills of the participants. ‘Alfaaz’, conducted by Literati, the Literature club of the Institute, saw the participants bring out their poetic streak and Zimfonia, the Music forum hosted ‘Karaoke Night’ wherein the crowd matched the beats and lyrics of popular songs. The combination of music, poetry and bonfire gave the crowd a perfect opportunity to unwind and develop solidarity with each other during Concord 2019. The event saw huge participation from far and wide colleges like IIM Nagpur, SIMSREE, SCHMRD, IFMR, Welingkar to name a few, who showcased their creative, innovative and practical acumen. Team ‘Counter Strike’ from SIOM, Nashik was declared as the winner and team ‘Vanquishers’ from SIMSREE, Mumbai attained the runner-up position. The winning teams were felicitated by Dr P Mary Jeyanthi (Assistant Professor, IMT Nagpur) in the closing ceremony. The three-day Management Olympics concluded with all the participants gaining keen insights and plethora of management knowledge.